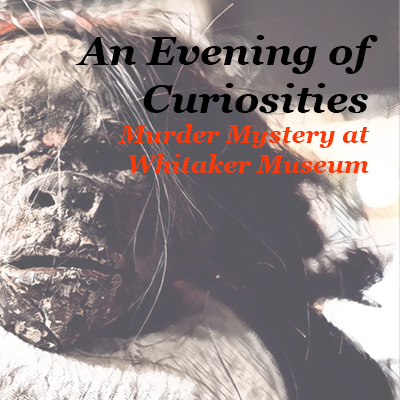 Here at the Whitaker we've teamed up with Murder Mystery Productions to bring you an 'An evening of Curiosities', can you be the one to solve the mystery? Uncover the clues from the dramatic scenes played out throughout the night and solve this curious case. Included in the ticket price, a sumptuous 3 course supper will be served for you to enjoy whilst you and your fellow detectives ponder the evidence and bring this early 1900's case to a dramatic close. During the evening our master of ceremonies will put detectives at ease and introduce the event. Detectives will then be introduced to the suspects as a team of professional actors present evidence which is vital to the detective's inquiries. Watch and listen very carefully detectives as you will soon confront the suspects “face to face” as they visit each teams to be interrogated. As your investigation gathers momentum more evidence will be presented, and further interrogation will take place. Following the second, and final interrogation teams are then given some time to deliberate, before submitting their conclusions. We'd love for you to fully embrace the spirit of the evening and welcome people to dress up accordingly, a victorian 1900's theme, (although this is optional) Prize for the winning team who solves the mystery, as well as bottle of wine for the best dressed.